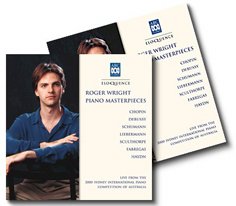 ‘Mirage’ for piano (1997) was recorded live on the album ‘Roger Wright Piano Masterpieces’ during Roger Wright’s memorable appearances at the 2000 Sydney International Piano Competition of Australia. This album also includes works by Chopin, Debussy, Schumann, Liebermann, and Sculthorpe. ‘Mirage’ for piano is published by Hidden Oaks Music Company.